Extending evidence of quantum behavior farther into the large-scale world of everyday life, physicists at the National Institute of Standards and Technology (NIST) have "entangled" -- linked the properties of -- a microscopic mechanical drum with electrical signals. The results confirm that NIST's micro-drum could be used as a quantum memory in future quantum computers, which would harness the rules of quantum physics to solve important problems that are intractable today. The work also marks the first-ever entanglement of a macroscopic oscillator, expanding the range of practical uses of the drum. Entanglement is a curious feature of the quantum world once believed to occur only at atomic and smaller scales. In recent years, scientists have been finding it in larger systems. Entanglement has technological uses. For instance, it is essential for quantum computing operations such as correcting errors, and for quantum teleportation of data from one place to another. The experiments, described Oct. 3, 2013, in Science Express, were performed at JILA, a joint institute of NIST and the University of Colorado Boulder. NIST introduced the aluminum micro-drum in 2011 and earlier this year suggested it might be able to store data in quantum computers. 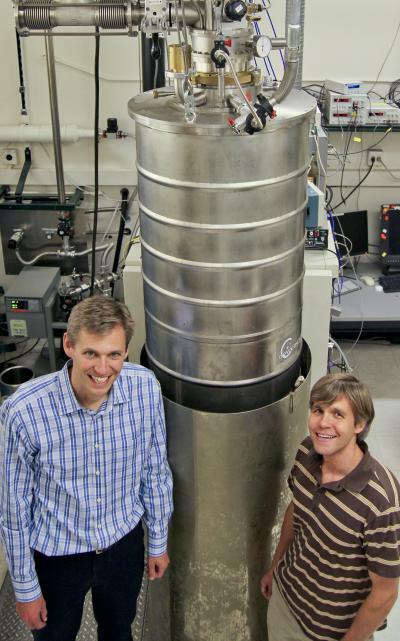 The drum -- just 15 micrometers in diameter and 100 nanometers thick -- features both mechanical properties (such as vibrations) and quantum properties (such as the ability to store and transfer individual quanta of energy). The drum is part of an electromechanical circuit that can exchange certain quantum states between the waveform of a microwave pulse and vibration in the drum. In the latest JILA experiment, a microwave signal "cooled" the drum to a very low energy level, just one unit of vibration, in a way analogous to some laser-cooling techniques. Then another signal caused the drum's motion to become entangled with a microwave pulse that emerged spontaneously in the system. The drum stored the quantum information in the form of vibrational energy for at least 10 microseconds, long enough to be useful in experiments. Then the same type of microwave signal that cooled the drum was used to transfer the state stored in the drum to a second microwave pulse. Researchers measured the properties of the two microwave pulses -- specific points on the curves of the travelling waves -- and found that the results were strongly correlated over 10,000 repetitions of the experiment. The evidence of quantum entanglement comes from the fact that measuring the first microwave pulse allowed scientists to anticipate the characteristics of the second pulse with greater accuracy than would otherwise be expected. The correlations between the two pulses indicated that the first pulse was entangled with the drum and the second pulse encoded the drum's quantum state. The results suggest that the drum, in addition to its potential as a quantum memory device, also could be used to generate entanglement in microwaves, to convert one form of quantum information to an otherwise incompatible form, and to sense tiny forces with improved precision.